In the week ending Feb. 13, the advance figure for seasonally adjusted initial claims was 473,000, an increase of 31,000 from the previous week's revised figure of 442,000. The 4-week moving average was 467,500, a decrease of 1,500 from the previous week's revised average of 469,000. 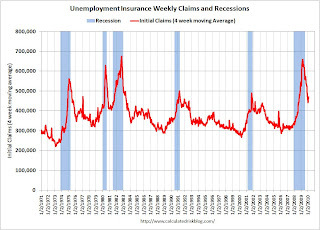 The advance number for seasonally adjusted insured unemployment during the week ending Feb. 6 was 4,563,000, unchanged from the preceding week's revised level of 4,563,000. The four-week average of weekly unemployment claims decreased this week by 1,500 to 467,500. The current level of 473,000 (and 4-week average of 467,500) are very high and suggest continuing job losses in February.